A baby elephant was rescued from a well in Andhra Pradesh on Sunday by forest officials with the help of police. The rescue workers used an earth mover to dig up the soil to make way for the baby elephant to crawl up. 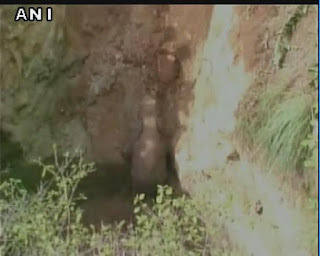 The tusker fell into the 25-feet deep dry well on Saturday night near Chikkapalli hamlet in Ramakuppam mandal. According to forest officials, the baby elephant was part of a herd of tuskers which strayed into the area for food and damaged the crops. After the baby elephant fell into the well, other tuskers gathered around it. Fear gripped the villagers as the area was echoing with wild roars of the angry elephants. The herd ran amok and damaged fields and an electricity pole before returning to the forest. The baby elephant was helplessly trying to come out and the forest department and local police swung into action Sunday morning to rescue it. An earth mover was pressed into service. Large number of people from nearby villages gathered aeound the well to witness the rescue effort. After crawling up, the baby elephant ran around in the village and the forest department personnel later guided it to the forest.